As public criticism of the Eric Garner grand jury decision mounts, a local judge has ordered a public court hearing to be held on Dec. 19, where he will consider whether to disclose all of the information about the jury proceedings. Staten Island man Eric Garner died after a police officer restrained him with a chokehold, during an attempt to arrest Garner for selling untaxed cigarettes. Last week, a Staten Island grand jury decided not to indict the officer, Daniel Pantaleo. 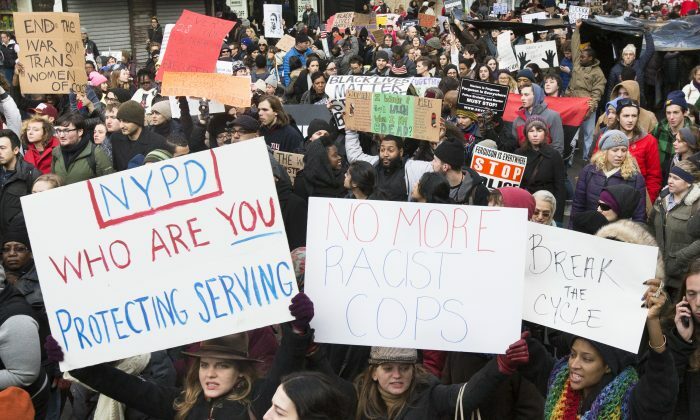 Since then, scores of New Yorkers have turned up on the streets to protest the decision. Several parties, including a public official, a civil rights organization, the media, and the legal aid society, recently submitted court applications requesting public disclosure of transcripts and other details from the jury proceedings. In New York State, grand jury proceedings are secret. Information can only be disclosed upon court order. Last Thursday, the New York Civil Liberties Union (NYCLU), filed a petition to disclose all transcripts and evidence that the grand jury considered in Garner’s case, as well as the instructions that were given to the jury. “The outcome of the Grand Jury proceeding has left many questions as to whether secret grand jury proceedings are instruments of injustice and whether the grand jury system should be abolished,” said NYCLU executive director Donna Lieberman in a statement on Friday. Staten Island judge Stephen Rooney has ordered a public hearing on Friday, Dec. 19, to consider whether to unseal all of the records from Garner’s case. Rooney had initially sealed the NYCLU’s petition. He lifted the seal after a New York appellate court ruled that a separate petition to disclose proceedings from the Garner case, brought by public advocate Letitia James, should be unsealed, according a report by the New York Law Journal. The New York Post newspaper and the Legal Aid Society also made separate petitions asking for disclosure, according to the Journal. They are all expected to appear before judge Rooney this Friday. Previously, Staten Island district attorney Daniel Donovan filed a request with Rooney to disclose basic information about the grand jury decision, but did not request the release of transcripts or evidence. The grand jury had deliberated for nine weeks, and heard from a total of 50 witnesses, including civilian eyewitnesses, police officers, doctors, and emergency medical staff. Sixty pieces of evidence were presented to the jury, including four videos that bystanders took of the interaction between Garner and officer Pantaleo, and records on NYPD policies and procedures. The jury also reviewed New York’s law on when a police officer is justified to use force to make an arrest. Following the Garner decision, and a similar non-indictment in the case of Michael Brown, a teenager in Ferguson, Mo., who was shot and killed by a police officer, the fairness of grand jury proceedings has been called into question. This past week, a group of New York state senators announced that they will introduce legislation appointing a special prosecutor to investigate cases of unarmed civilian deaths caused by police officers. State attorney general Eric Schneiderman submitted a request to governor Andrew Cuomo asking for authority to investigate such cases.